Islamabad: Pakistani Foreign Affairs Adviser Sartaj Aziz held talks with the visiting Foreign Minister of Yemen, Abdul Malek Abdul Jalil Al Mekhlafi, and reiterated support to the legitimate government of President Abd Rabbo Mansour Hadi. Al Mekhlafi arrived in Islamabad on Monday on a two-day visit for talks with the Pakistani leaders on bilateral matters, focusing on diplomatic efforts for solution to the conflict in Yemen, a Foreign Office statement said. 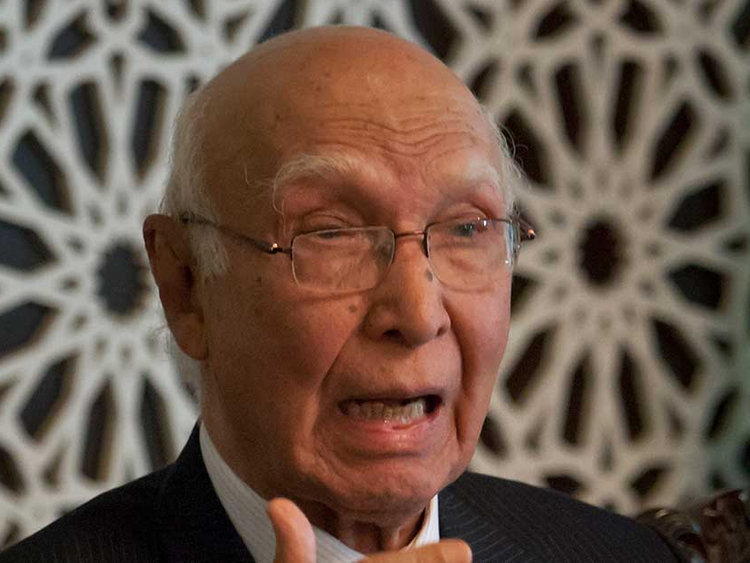 “Pakistan has always supported the unity, sovereignty and territorial integrity of the Republic of Yemen and would continue to extend all possible assistance for restoration of complete peace and stability in the country,” Sartaj Aziz told the Yemeni Foreign Minister, according to the statement. The Adviser appreciated the efforts of the internationally recognised government of President Hadi towards restoration of peace, harmony and stability in the country. He also noted with satisfaction that these efforts had acquired control of over 80 per cent territory of Yemen, hoping that, with international support, the situation in the remaining parts of the country would also be brought under control. Issues related to serious humanitarian situation in Yemen, and suffering from serious food shortages elsewhere in the world, were also discussed. Al Mekhlafi thanked the Adviser for Pakistan’s continued political support and economic assistance to Yemen. He also briefed the Adviser about the current situation in the country, the efforts by the government of Yemen to pursue the path of peace and reconciliation rather than conflict, as well as the success achieved so far in subduing the threat posed by terrorist networks in the country. He also highlighted the efforts being undertaken by the government to address the multiple security, political and economic challenges confronting Yemen.